Tuna Enchiladas, quick and easy, hot or not, quick and easy main course for two. You could use shredded turkey or chicken in these as well as the tuna. I use a Swiss cheese but Colby or Cheddar would be equally good. The green olives work well with both the tuna and the sauce, rounding out the flavors. Chop onion, green pepper and celery. Drain chiles and tuna. Chop chiles if whole. Heat oil in medium nonstick skillet. Add onion, pepper, celery and garlic. Sauté until vegetables are tender, 7 - 10 minutes. Remove from heat. Add green chiles and tuna. Dissolve cornstarch in water. Stir cornstarch into simmering broth to thicken. Put 1/2 cup of the sauce into a baking dish large enough to hold 4 enchiladas. Add 1/2 cup of the sauce and 1/2 cup of the cheese to the tuna mixture. Divide the tuna mixture into fourths. Spoon tuna onto the tortillas and roll up. Place seam side down on the sauce in the baking dish. 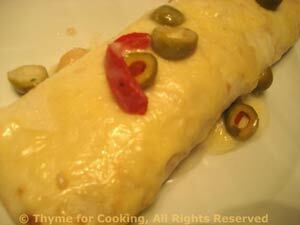 Pour the rest of the sauce over the finished enchiladas, sprinkle with the remaining 1/4 cup cheese and the olives. Bake at 375F (190C) for 15 - 20 minutes, until heated through and cheese is bubbly. The difference in calories and carbohydrates in tortillas is amazing, corn tends to be lower in both, but also smaller in size. The information is based on 4 tortillas with 80 calories and 13 carbs per tortilla.